Wow. So incredibly thrilled to be joining this talented group of designers to showcase the AMAZING new Simon Says Stamp release, Cold Hands, Warm Heart. These products are all seriously adorable, so be sure to check out all the products in this release as soon as you are done with this inspiring hop! I have 4 cards for you today. I couldn’t stop playing! I hope you enjoy. Gold with a bright accent color is totally my thing. I decided to hand cut some of the tiny gold trees as part of the shaker card filler to tie it all in. This new tree background is nothing short of amazing and would be equally cool watercolored, too! Next up, I have a super fun and bright card using the Four Trees Stencils. These are so cute and fun to play with. This background die is just simply gorgeous in whatever color you die cut it. It is so versatile! Last up, I have some fun skates for you! For a chance to win an amazing Simon Says Stamp Goodie Bag full of fun Simon treats, be sure to leave comments at each stop on the hop. The giveaways for the prize pack will close at 1:00pm EST on Friday, October 10, 2014. Heather is your next stop! I can only see 1 card. Love the bright pink and the gold. Stunning! I am getting so inspired – never thought of embossing a background stamp-wonderful card! WOW!!! These are just AWESOME! Love them all! Your cards are just full of Awesomeness!!! Wonderful cards Erin. Amazing backgrounds and colors. Especially love the first one with the heat embossing. So cheerful and colorful! Thanks for sharing. Beautiful cards, love how you use non tradition colors. I have a thing for ice-skates, so i just love your ice-skate card. WOW! Awesome cards!!! Love, love, love! Beautiful array of cards! You've been a busy stamper! Pretty cards, the ice skate one is my favorite. Oh my gosh! These are so awesome.. I am in love with that bright shaker card. Wonderful holiday cards…so creative! Thanks. I love that background die! Stunningly beautiful. This is my first blog hop and loving every minute of it. Gorgeous cards, especially the gold die background on the snow for the holiday card. Love it. i love that background stamp. must have it! Great ideas, especially love the gold background card. I'm loving the bright colors! Oh what bright fun cards! All of your projects are just amazing!! Love them! Awesome cards! Love the bright colors! I like your colorful cards! especially love your first cards – gorgeous and so elegant!! Really bright and creative cards!! Great job! Bright and festive, love your bold colors. I also like your soft colors for the ice skate card, gorgeous!! Your cards are just so colorful and lovely, love them! Love the bold colors! Great cards! Erin, you have done amazing things with the backgrounds of these cards. I love them all! The skates are my favorite! Wow! Your cards are stunning! Oh wow, all the bright colors and gold is just amazing! Love these fun, non-traditional color choices. Wow! Really love the first card! Fantastic! No red & green in site. I really like the shine. That black and gold card is gorgeous! The card with the skates is so classy! These cards are so pretty …and colorful! OMG!! Lol! You are my hero using Gold and bright colors! I too love this combination and oft feel my creations are a bit too much. I love using shiny gold or silver card stock and inks. Thank you Erin!! All four cards are just beautiful! I especially love the one with the skates. Erin, Your cards are so bright and cheery. Very creative. Love the bright colours you used! And the use of that background die is so cool! WOW Girl Love all 4 of your cards!!!! You sure did super clever and creative jobs and definitely came up with such fun ideas and great techniques. You are so talented and definitely craft with lots of passion!! YOU so ROCK!! Each card is lovely but eh first is my favorite. the fuschia and gold is a beautiful combination. Now you came out with the big bold colors. Great cards! Loving your color palette, especially in the first card! Love the skates card the best! So cute. Thanks! Love these! I might have to get me some new stamps 😉 So cute! Love the bright & colorful card, so happy looking. Each card is really wonderful! Love your thought and creativity! Love the bright colors. So pretty. Wow! So many fabulous cards! Mu favorite is the gold lattice! So much impact! TFS your cards, the colors are refreshing, not just plain ol green and red. SO BOLD! Love them all, busy girl! 😉 Awesome colors on all! Love your cards!! Fun new release!! LOVE the Christmas tree background stamp and the idea of the shaker card! Thanks for sharing!!! Such a rich looking card! Such fabulous alternative colours and they work so well with this fun collection. Erin – Beautiful cards! I particularly love how great the gold foil paper looks cut from the die. Thanks. Gorgeous cards! LOVING that fantastic coverplate, that first card is just stunning! Your backgrounds are awesome!!! I love the design of your cards. Nicely done. I love bright colors! These are beautifully done! very versatile. great and creative designs! Lovely cards – so different! Stunning cards! Very well done. I LOVE how graphic everything is! So beautiful! Gorgeous yummy colours. Real eye catchers! Each of your cards is so unique & lovely. So many great cards! Thanks! Wow what beautiful cards. I love the bright colours and the gold embossing. I love the 2 versions of the background die. Wow, awesome cards! I love those little trees in gold! Love the bold and colorful style of your cards, they really have the 'pop' factor! Gorgeous, love the pink and gold one!!! Love the colors on the skates card. I love these trendy cards! Super cute. Love the gold and bright colors. Love all your cards. Great work. The backgrounds in every card was wonderfully done. Good job. Stunning cards! Love the gold one! Thanks for sharing! I love that you've used bright colours instead of traditional colours. They're so eye-catching! LOVE! This is so adorable! I love the backgrounds that were created. They really tie the card together! Love those bright colors, such fun textures too! Festive and bright! Great ideas. Love all your cards, and that sentiment "happy new gear" is great! I really love the gold background on the skiing card! I just love your style! happy and fun! Wonderful cards here tfs! Adding tiny gold trees cut from the background stamp is the perfect touch to the shaker card. Beautiful and vibrant backgrounds on your cards. Love the die in gold also, very pretty with the ski's. That gold background is stunning. WOW!! Your choice of colors for your cards is awesome! Such lovely colors!!! Beautiful cards!!!! Love the projects and the products. Awesome job! I love the colors you've used for your cards! So bright and happy! Ooh! Fresh! I just love the pink & gold shaker and the Hello Snow on gold background. Awesome cards! WOW, that baokground die is awesome!! I really can't choose any one thing from this release-love 'em all!!!!! I LOVE how bold and vibrant these cards are! So amazing. I cannot pick my favorite. These are simply awesome! I really like all the bright colors you used. Dude! You killed this release!! I love each and every project, and am in awe of how you gave your special "Erin" touch to these new products!! Way to knock it outta the park, sistah!! The colors are bright and beautiful on your cards. Your cards are perfect for the season — very bright! Great colors and great cards! You really outdid yourself! Absolutely LOVE all of your cards! I love the non-traditional colors, they're so chic and trendy :)! All of your cards could be straight out of the Great Gatsby! I love how you've brought Art Deco to the holiday season! ALL of your cards are awesome but my favorite is the first one!!! I love the colors you chose and the silver rocks!! TFS! Wow! Love what you do with color. Amazing. These are all stunning designs! I really love the touches of gold!! Thanks for sharing! Very bright and festive cards. Thanks for sharing. Love the beautiful colors you picked to use. Nice colorful cards! Love that background die on your two last cards! Foil seems to be the new go-to product. I love how you used it in your card, and I also like the bright colors. What wonderful colors on your cards – they are terrific! You really rock the backgrounds — they are all wonderful! But I really love the shaker card — I think the magenta color caught my eye. I didn't realize it was a shaker card at first. Very clever! I love how different they are. I think I might have to buy the set. Also the two blogs before yours would not allow me to leave a comment. Wowzers! Super cool cards! Love the unique ideas and all those colors! Just love how you used non traditional colors on your cards. Love that gold embossing tree card. Perfect. The golden backgrounds are amazing! Pretty bright and colorful cards. Love the skate card too. Oh, just love these unexpected designs and colors! So creative! Very nice! I love the shaker card. Wow! Great cards. So bright and fun. These are so unique. Love them all. Heather, your cards are wonderful and that die is gorgeous. Such wonderful cards. I love all the bright colors you used! great cards! Love the stencils! So many amazing cards, love them all! Wow! Those are fabulous! I love the gold on the stamp and the die cut. Woah! That gold background is amazing! All I can say is WOW..You took this to a whole new level. Awesome. Love the colors, and how you combine them to make unusual, bright holiday cards! thank you! Love your cards! This is such a fun release. Wow! You really outdid yourself. Love all the bright intense colors and your attention to detail. Thanks! Really like the gold and purple Joy to the World card! Great colors! Love the bold bright colors and the gold, stunning! I LOVE your style…bright and bold! Great cards! Can't wait to get some of those winter stamps! Thanks for sharing and for the chance to win! Awesome shiney backgrounds they are fantastic! I think gold with a bright color is a great look! Makes for a very stunning card! Loving your bold style. The colors and gold are incredible. Thanks for the inspiration. Love all your cards. They are awesome !! Great cards! I never think of using bright colors for Christmas cards. I just may have to give it a try. Thanks for sharing. Love how bold your cards are! They're great! that Gold one is simply stunning. wow! all the cards are gorgeous! My two favorites are the brightly colored background, and the gold die cut chevron! I love your "glamour!" Your backgrounds are beautiful! Such great new products! I LOVE your color choices. Those cards were so striking! Quite the fun display of many things in this release. Thanks so much! Love the cards & the colors! Love all the bright colors and metallic on your cards. Love the bright colors and the background stamp embossed. Wow!! I love the cards!! These cards are so eye-catching! What beautiful cards! Thank you so much for the inspiration! Wow–you are a WIZ with those new stencils and design-dies. I was intrigued by the Xmas tree ones, and you've used them very creatively. LOVE the die-cut background with the snow gear stamps (being from Canada, I have all that stuff in my closet, but NOT in my stamp collection–yet!). THanks for the inspiration. Your cards are gorgeous! Thanks for the inspiration. Love the bright non traditional colours used on all those cards. Wow love the embossing and the gold and those skates! Those are beautiful cards! Thanks for doing so many! What fabulous colors! Very festive and bright. These cards are SNOW cute! I am so impressed with how different each of your cards are! Absolutely bright, colourful and fun cards! Oh Man I can't get enough Cards! Your color selection is SMASHING! Bold and Bright, this year I'm not going with the traditional colors. Thanks for all the wonderful ideas. Wow, way to rock the stencils and dies! wow!! amazing set of cards! wow wow wow. I love your cards. Especially that first one with the bright pink and gold. Man awesome are all four. Thank you for sharing. Great cards. Love these non-traditional fun colors for Christmas cards! Wow, you have been a busy lady! These cards are just gorgeous!!! I love the colors you chose. Non-traditional yet still absolutely stunning and it still emulates the Christmas feeling. Sometimes that can be difficult when not using standard colors. Fabulous cards!! Love all the gold!! That background die is to die for! You made some wonderful cards. Great card. Love this new release. Love your cheerful colors and beautiful cards. I love that you used nontraditional colors to create your cards. They are just beautiful! Thanks so much for sharing! Awesome cards. I love that you cut some of the trees to go in the shaker card. Clever idea! I have one word for these cards…..STUNNING! Really cool techniques on your cards! Those dies made some awesome backgrounds! Love the metallic! Whoa! The gold and colors on all of your gorgeous cards would make anyone's holidays merry and bright! Thank you so much for sharing them with us. all the cards are wonderful. i especially like the joy to the world card. so lovely. OMG! What a beautiful selection. Totally enjoyed them! Love all the cards! Especially the ice skates! Wow, love the geometric shapes and colors used on these cards. Fantastic cards! Love the bright colors on the first two. Stunning cards! I love them all & can see the Triangle background die is something I really "need"! Great cards. I particularly like the black shaker card. It has such an impact with the black, gold and bright pink! Wonderful cards!! Love how you used the stencils!! Such unexpected colors! Love it when someone does something completely different! Oh my goodness you're cards are so beautiful. I just love the tree background. OH My that background die used with gold is adorable with the hello with the winter items. Great ideas. Thank you so much for sharing them. I really liked all of your cards and especially liked the play on words withe ice skates card. The watercolor background and the gold background die cut were absolutely beautiful. Thank you for sharing your creations. Absolutely LOVE the bright pink with the gold trees on top of it! Beautiful cards, thanks for sharing them with us. What bright and happy cards – thanks so much! 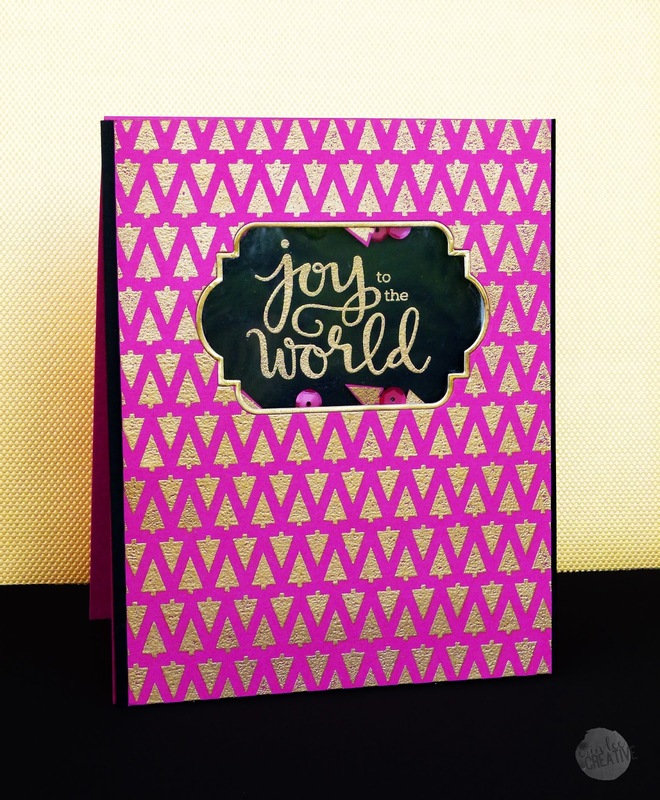 I am totally in love with the pink Joy to the World card! I just love it! So beautiful! Great cards, love those backgrounds. Oh this is awesome! Love the pink with the gold… It really pops out! Love all the colors and techniques! Great representation of the new release! Beautiful colors! I don't think of choosing these kind of colors for the holiday, but it love them! The first 2 cards are so bright and colorful and the second 2 are wonderful with the pattern die cuts! -wonderful. I never thought of stamping an embossed background. TFS. What a wonderful variety of cards. Love your embossing and use of the die cuts . Well done. Love how creative you were with different colors for Christmas. I love Christmas decorations in unexpected color schemes. Nice work! Great cards all, but LOVE the colors on the Peace on Earth card. So happy! Fantastic cards! I must confess that at first glance I didn't realise the background of the first one was trees! Optical illusion? Such beautiful cards! Thank you. This is a fun and fantastic release ! Bold colors and amazing backgrounds — love them all! Fabulous cards! I love your backgrounds!!! Thanks!! I love blue and ice skating, so the ice skate card is my favorite. Thanks! So festive! Loved the colors. I really love your use of metallics! Beautiful cards and such fun color combinations as well. Oh I love the gold overlay on the ski card! My favorite stop along this hop so far!! Great cards!! I love that background die! love the bright no traditional colours. My favourite is the last one! Perfect! I LOVE all of your gorgeous and inspiring cards, thanks. Awesome release and use of the products. Love your use of color and the dynamic design. Wow, your Christmas cards are stunning! Love your cards and use of colour! Very bold and vibrant cards, completely different from all the others, a great job!!! Seriously lady…every single card you make I love. Your style is fan-freakin-tastic! Great cards using lots of great new products – thanks for sharing! love that these are so unique and non-traditional! VERY STRIKING color combos!!!! Fabulous cards! Great job on all of them. Love your fab cards! That tree background is awesome. Awesome cards – I love that tree background in your first card! I really love the tree background and triangle pattern die. The products pack a real impact. You have made such WOW cards with so few layers or embellishments. The colors you chose really show off the elements! Very fun and festive cards. Wow! Great cards!! Love the gold foil and gold embossing you used for cards #1 and 3! Very pretty, bright colors! Nice designs. Love your creations! Loving this new release!! You really did have a lot of fun! Thanks for sharing your bright and cheerful cards. Wow! I love those gold trees! All your cards are just beautiful. Cute!!!! Wish I could buy all the sets. What gorgeous cards! I love all the nontraditional colors. Thanks for sharing, and thanks for the chance to win! All of your cards are fantastic but I definitely need to make the ski goggles for my daughter. Bright and cheery cards for sure, love the background die in gold too!! Great cards. Amazing use of the new products. All the cards are really nice but your first one is just stunningly beautiful! I love the bright colors. I really like the Joy card. I am so impressed with the gold die-cut background on another card. I looked for instructions but didn't find any. Am I missing them somewhere? Lots of neat stuff in this release. Thanks for the ideas on how to use some of them! Great inspiration! I love this release! Love the shading of the background with the trees. The helmet and poles on the sentiment was a cute touch. Love your cards, especially the background die in gold. Awesome cards!The purple cardstock with the gold embossed tree background card is my favorite. What amazingly bright and stellar cards! Thanks for sharing your skill with us all! Nice cards. I like how you combined the sets. I am in love with that background stamp! Thank you for sharing. Good work and very cheerful. Awesome cards. Love all this inspiration! All your cards are amazing. Thanks for sharing. Wow–love all of these beauties, but have to say my fav is the first one as my favorite color is purple! So elegant and striking. Thanks for sharing so many ideas and lots of mojo. Wow! Stunning cards with outstanding color combos! Spectacular cards! I love your color choices. I'm going to copy you! Love all your cards, especially the snow skates one. Skating on the pond was a big part of winter for me growing up in Massachusetts. I always have to have snow skate ornaments on my tree each year because of the fond memories of my whole family skating on the pond late into the night, with a big bonfire burning in the middle that lite up the whole pond. It was so much fun!! Beautiful cards, specially the gold one! That shaker card is amazing! The color accents totally make it! Cute cards! Really love the gold triangle patterns background! I love the non-traditional Christmas colors in your cards. Very bright and merry! I love your bright, cheery cards! All the energy makes me smile! Thanks so much for sharing! Great combination of the magenta and gold! I honestly can't choose which is my favorite card. Anything that's gold I absolutely love! But I love the background you made with the distress inks as well! Love them all. I can totally understand why you made so many. I wouldn't be able to stop. Great work! All great cards! My favorite is the ice skates, so glad I ordered that set! Thanks for sharing! Love them all, but the gold background… stunning! Your cards are simply beautiful! I love the use of the triangle die for the background. Great cards! I especially love the bright rainbow Peace on Earth card! I like that you added trees to the sequins in the shaker card. I absolutely love the "Hello" card. Gold is a fav, and the other colors pop against it. Good job. Great cards. Love the little trees in the shaker card. What a great assortment of cards! Thanks for the inspiration! Beautiful! I love your bold color choices! I really love those ice skates! Wow what awesome cards…love that background plate. Your colors are awesome!! Terrific cards! Seriously loving your use of gold. So striking! Love all of your colorfulness. Thought I could get by with out the tree background but love that gold with the pink/magenta! Like it as a shaker too. Every card is a winner. Wowee! You use such fantastic colors! The blues on that skate card are so perfect. Amazing cards, Erin! Such wonderful backgrounds. Great cards! I love the gold background die cut! Such cute cards. I really love the one with the skates. Beautiful cards. Each and every one. So much color and glam. Love them all. Your post surprised me; striking colour combo's…bright gold with pastel. Absolutely beautiful and distinctive. Love your take on things. Your card designs are adorable! Thanks or sharing this fun new line and for the great giveaway! OMG I love them all!! Such a bright flash of colour and then gold and mint (my favourite). All of them sensational!! Wow your colorful cards are fantastic !!! Wow…these are simply amazing! I tend to do minimal backgrounds, but may have to play more. I like your use of bold colors and metals. The ice skate card is my favorite! Very unique cards, something different for a change! Love your cards. You created fabulous backgrounds. oh my goodness I love these cards so much! I love the first one – that bright magenta with the gold tree background is a beauty. And that background die cut is gorgeous in gold. Love love love these so much! I love the metallic gold look!! I love the rich colors with gold on your first two cards. Absolutely stunning. Lovely cards! LOVE ALL those colors! Fantastic job with this release. Thanks for all the inspiration!! I love the unusual colors!